Years ago I was running a workshop with a bunch of very important men. About forty of them. Half way through the day, one of them came up to me. He was red and flustered. ‘Have you got a change of clothes with you?’ he asked getting pinker by the second. ‘Yes, have I spilled something?’ I said laughing. ‘You’ve split your skirt. If you like I’ll walk you out so no-one else can see’. Even more so when I saw how and where I had split my skirt. It was a little on the tight side and it had split right down the seam, which ran down my bum, revealing my white knickers to the world. OH FLOOR, PLEASE SWALLOW ME WHOLE NOW AND SPIT ME OUT IN A PARALLEL UNIVERSE WHERE THIS DID NOT HAPPEN. I got changed. No-one said a word. And to this day, I have no idea when I split my skirt, or how many of those men saw my underwear. I do know I will never forget who it was that told me, or how grateful I was that he plucked up the courage even though it was clearly awkward for him. 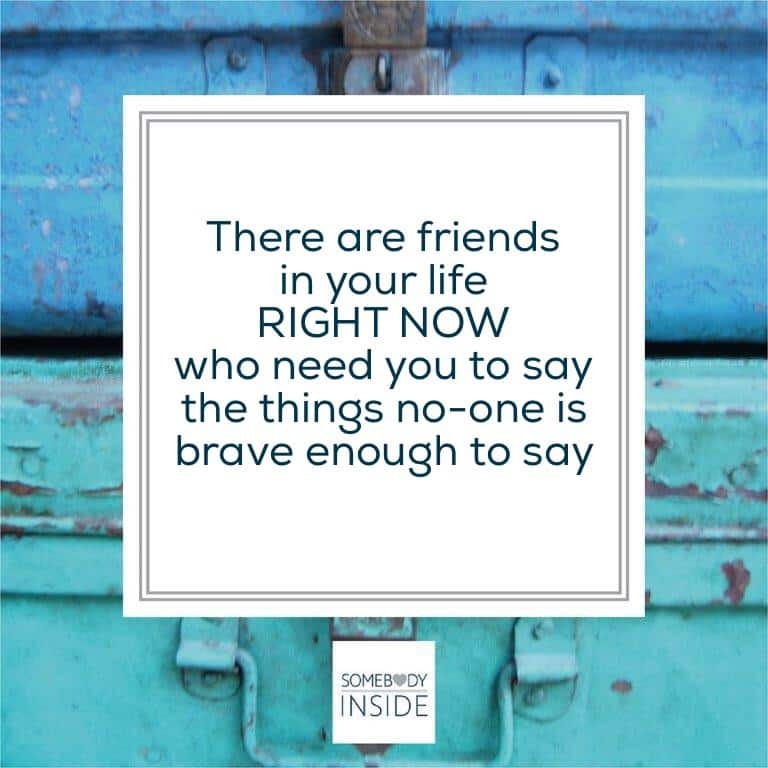 There are friends in your life right now, who need you to say the things that no-one is brave enough to say. Here at Somebody Inside, we describe it as the art of Ruthless Compassion. It means being able to say things that are potentially a little sticky, BECAUSE YOU LOVE THE OTHER PERSON SO MUCH. Let’s be clear for a minute, this is markedly different from needing to say something because it’s bugging you or you just wish said person would sort their act out for the sale of the world at large (sigh). It’s not that chat about someone REALLY NEEDS TO TELL X that she does not look good in that dress. Because that’s you passing your stuff onto someone else. Dropping a shame bomb and then stepping back to see what happens. Ruthless compassion is very different from that kind of heartless blurting. Women who act from a place of Ruthless Compassion know when to say what needs to be said and they have a way of saying it that is so filled with good intent that the other person almost always receives it in exactly the way it was intended. With love. Ruthless is a bit of a tough word eh? Especially for those of us women who want to be the voice of love in the world. And yet, in this scenario, if I am constantly worrying about the pain I may cause another person, I step into a place of protecting them, or at the very least leave that conversation that is BURNING to be said for someone else to pick up. It’s not that I don’t think it needs to be said, it’s that I DON’T WANT TO BE THE ONE WHO SAYS IT. I just busy myself with life, hoping that someone else will do it. Except what usually happens is that the thing they are continually doing that is not quite making sense or working out for the rest of the world, well, it slaps them in the face and they go down to the ground. Or life just gets gradually tougher and tougher. PAIN CAUSED ANYWAY. USUALLY A LOT OF IT. Time we found another way right? The ruthless bit really means I have to stop worrying about ME focus wholly on you. I have to stop worrying about the pain I will cause you and find a way to say the thing that needs to be said. Because deep down, I KNOW it needs to be said, and every time I don’t say it, I put my needs ahead of yours. Right now, my needs are trivial compared to what’s going on. So I leave them on the table and show up for you. Replace all that worry about hurting with a whole new intention. Being wholly present for you, my dear friend, and being completely with you, so that you can hear what needs to be said with all the love with which it is given. (By the way, this is NOT the same as saying, ‘I’m only saying this because I love you’ and then lobbing over that shame bomb again. SHOW you love them in the way you say it and in the interest you take in what comes back). Show up so full of love that it is possible to hear what is being said without shame and hurt. Sometimes we overdo it and compassion turns into sympathy and then coddling or colluding. And here we are, back worrying about the impact WE HAVE HAD on the other person, rather than what they really need. When we shift to colluding or apologising profusely and backing out, we are MAKING IT ABOUT US AGAIN. We cannot be present for the other person because we are lost in our own story about hurting people. We are trying to avoid being the bad one. When we empathise with someone, we walk in their shoes, connect with the feeling they are experiencing and we let the other person know that in all of this they are not alone and they have nothing to be ashamed of. So connect with that feeling as you step into this conversation. No stories of, ‘well this happened to me and it was pretty bad’ and more of, ‘I’m hearing this is really tough for you. What would help?’. No, ‘Poor you, isn’t this awful?’ and more of, ‘I know this is tough. Talk to me more about how you are feeling right now’. Connect with their feeling. And stay on dry land where you can be of service. Get fully present in the conversation. You have no idea what is really going on for your friend, you have your story of what you think is happening. Which is not even a little bit the same. Once you have said what you need to say, sit up, make eye connect and BE THERE. No planning what you’re going to say next, no wishing you could get this chat over and done with because that was a bit awkward. Be the very best listener you can be. Listen, listen, listen. We women love to fix. We love to rescue. Which leads us straight into a whole bunch of ‘why don’t you do this?’ conversations. Breathe into the conversation. Trust that there is time to create alternative possibilities and that between you, you have all the skills you need to make them happen (if not, you can always read our tips for infinite possibilities here) and let what needs to be said by both of you have its space and healing. And maybe then, solutions. And maybe not. You’ll know if you trust that wisdom you have inside. Of course the guy who told me my skirt had split didn’t have to do all of this. He was a great example of courage when something needed to be said though. There will be times in your life when you are the ONLY person who can show up and be what’s needed. The very best friends commit to learning how to do this. Even though it feels a bit icky sometimes. Mastering Ruthless Compassion takes practice. For now, commit to always showing up with love and service to your friends in this life. Who knows what magic you might create? Brilliant advice as always, this can be used in so many situations. So pleased you enjoyed this Pam! And yes, we think this is a HUGE topic for so many of us.